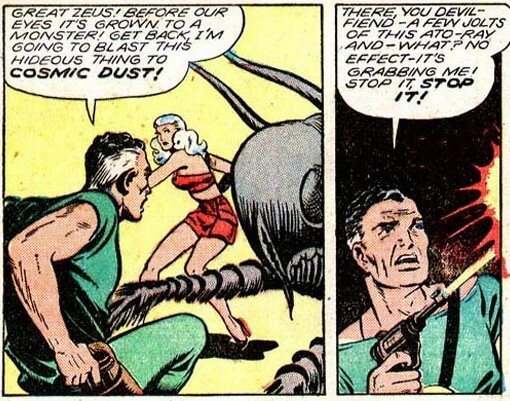 In Planet Comics #55 (helpfully shared by Sleestak, naturally), Mysta doesn't so much fight giant crickets as watch other people do it while she gets to the threat behind the giant crickets. What's really interesting about this story though is the subplot in which Earth's governing Safety Council (formerly called the Science Council) has selected a new leader who doesn't see the value in Mysta's ubiquitous assistance. Mysta acts strangely in this adventure too. Not so much at first. Her disguising herself as a technician in order to spy on the Council's new leader is very much like her. As is her willingness to let him fail without her in order to teach him a lesson (of course she stays close enough that she can step in and clean up when needed, but that doesn't go entirely according to her plan). What's weird is that even though the new leader fails and she saves the day, she stays undercover at the end of the story and lets him think that he succeeded. Sleestak speculates that Mysta thinks she can best manipulate the new leader if he isn't threatened by her. That makes perfect sense to me.